The PCC Lunchtime Seminar Series is run by the School of Geography, Archaeology and Palaeoecology at QUB in Belfast. I believe that they have been going for some time now and, although I’ve regularly been told about them and how I really should get along there, I’ve somehow not managed to make it. However, I promised myself that the next opportunity I got I would definitely attend – come hell or high water. I spoke to a friend of mine who told me that the next one coming up (Tuesday 21st February 2012) was on Early Neolithic Farming. I liked the sound of that and I promised faithfully that I would be there. It only occurred to me the day before the lecture to enquire who the speaker was. 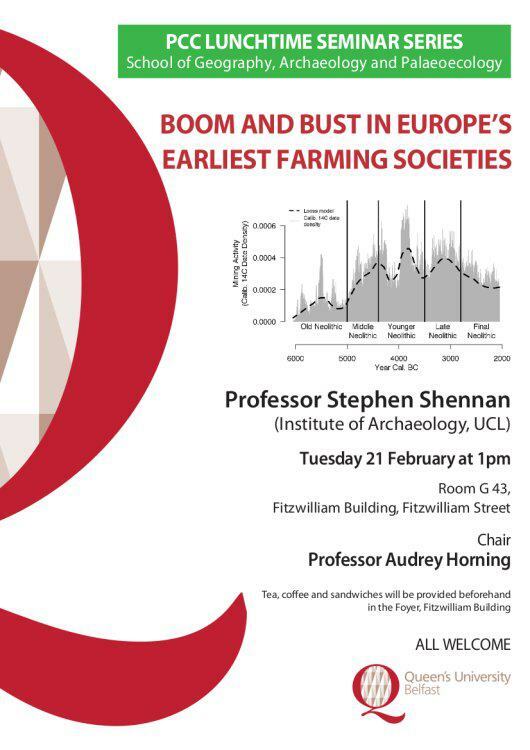 When I was told that the speaker would be Prof. Stephen Shennan my heart just fell. I have nothing against the man, I truly don’t. Prof. Shennan is Director of the UCL Institute of Archaeology. He is also Professor of Theoretical Archaeology, and Fellow of the British Academy. As I found out when I spoke to him after the lecture, he is a truly affable person with a ready smile and keen sense of humour. Nonetheless, for me his name is eternally associated with that part of my life, during the mid to late 90s, when I was embroiled in writing my MA thesis [also available: here]. I was working on a statistical and morphological approach to the ringforts of the Loop Head Peninsula in Co. Clare and Shennan’s book, Quantifying Archaeology, was my constant companion. There were certain sections of my thesis that relied so much on his work that I was afraid of being dismissed for plagiarism. I even had dreams about repeatedly typing ‘Shennan (1988) says/states/argues’ etc. By the time I completed my thesis, my copy of Quantifying Archaeology was in such a poor state it had to be held together with rubber bands. Yes, I was slightly terrified at being in the room with this man. As it turned out there was no need to be. He began by outlining some concepts of Evolutionary Demography Theory. The concept is that for people in past societies, producing children were not so much a means to an end, but a good in their own right. There are also a number of trade-offs implicit in having children, not least of which is the number of children it is possible to bear, but how many of one’s offspring can feasibly survive to sexual maturity and become parents themselves. Changing environmental and technological conditions can thus alter the balance of these trade-offs, resulting in increased or decreased fertility. To illustrate this, Shennan showed a graph comparing the ages of women giving birth for the first time in a modern Mayan community and how the demographics changed after the introduction of electric pumps to supply water. In the pre-electric pump society around 50% of the women had given birth to their first child by the age of 21. However, the addition of the electric pumps allowed women to be freed from the drudgery of water carrying and resulted in an increased carrying-capacity for the society. In the latter situation almost 75% of women had had their first child by the age of 21. Shennan was quick to point out that the decisions to have children, what numbers, and at what time, are carried out a household level, but have large-scale population-level results. Thus, there are demographic consequences in acquitting a new adaptations and technologies, such as cereal- and pulse-based agriculture. Where we find evidence for population stability, it may be taken as evidence that a local carrying-capacity ceiling had been reached. Shennan sees the spread of farming in the Neolithic as a classic example of a dispersal opportunity acquired through greater technological achievement. There is also the fact that this form of agriculture is extremely portable – seed and livestock may be moved with relative ease. Shennan argues that this all leads to a significant increase in environmental carrying capacity that results in both increased fertility and eventual population growth. He argues that, contrary to some theories of the spread of agriculture, this is not a population ‘push’ process but a biological ‘pull’ process. This means that it is not a situation where an increased population is forced to develop more effective means of feeding itself (thus adopting agriculture). Instead, this model is one where the population acquires agricultural skills and then discovers that it can support more and larger families, leading to a population growth. Shennan noted that while there is much in the published literature about the earliest beginnings of agriculture, many researchers appear to assume that once it is in place, there is little to be interested in. However, in examining the evidence from eastern France, the data shows a sequence of population expansions, interspersed with well defined gaps where the population contracts (Peterquin et al. 1996). For example, Zimmerman’s (2009) analysis of Neolithic Bandkeramik sites in the lower Rhine basin. Here there is evidence for population growth at the beginning of the Neolithic, around 5300 cal BC. There then appears to be continued growth for over a century, followed by severe population contractions by around 4900 cal BC. To test these hypotheses, Shennan and his team (Sean Downey, Adrian Thompson, Kevan Edinborough & Mark Thomas) used summed radiocarbon date distributions as a proxy for the relative amount of population activity. This approach was then used to compare data from the pollen record with radiocarbon dates from across the UK. The methodology involved converting the pollen spectrum into ‘Land Clearance Category Reconstructions’ plotted against the summed and normalised, geo-referenced, radiocarbon dates. This was all then divided up into bins of 250 years. The available data runs from 9000 cal BP to around 3600 cal BP. The UK evidence shows an inferred population growth (what Shennan terms an ‘upward blip’) around 7600 cal BP. This is paralleled with a ‘downward blip’ in the amount of deciduous woodland. Essentially, the arrival of farming is shown to result in an increase in the population, coupled with a decrease in woodland. At around 5300/5200 cal BP there is an observable drop in population that continues to after c. 4500 cal BP. After this point there is an increase in deciduous woodland and (unexpectedly) an increase in semi-open pasture. Again, around 4400 cal BP there is a decrease in woodland and a corresponding increase in semi-open pasture that is taken to suggest an increase in population. One of the interesting conclusions to be drawn from this analysis is that it suggests that what we are witnessing is anthropogenic change to the environment – as opposed to climate change being the primary determining factor. To test the robustness of these dates and this methodology the dates were segregated by type. In this way dates from cereal grains could be separated from dates associated with upstanding monuments. In theory, if there is a genuine underlying trend in population growth, it should be mirrored by both sets of data independently. Certainly, this has been demonstrated to be the case during the earlier Neolithic, but there is a marked divergence in the patterns during the Late Neolithic, from around 4000 cal BP. This model was then recreated for ten different regions in Western Europe. 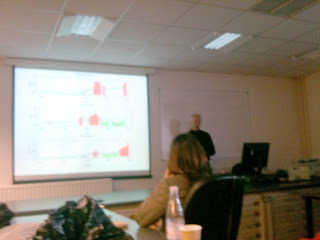 Within each of these regional studies, Shennan and his team took 1000 dates as a ‘bootstrap sample’ to model variation. For example, in the Scottish study there were 305 dated site phases. Here there is an observable population boom around 5500 cal BP. In Ireland, with 1031 dated site phases, there is a similar population boom at around 5500 cal BP, followed by a trough around 5000 cal BP. A further rise in population may be noted around the period 5000-4000 cal BP. In Germany, where farming was introduced approximately 1500 years before it reached Ireland, the Bavaria-Baden-Wurttemberg study area shows peaks at 7000 cal BP, 5500 cal BP and 4600 cal BP. There are also intervening troughs in population centred on 6200 cal BP and from 5200 cal BP to 5000 cal BP. Similar regional studies were carried out for the Low Countries (347 dated site phases), the Paris Basin (188 dated site phases), and the Rhone-Languedoc (340 dated site phases) areas (among others). In all of theses the general pattern of population booms and busts is repeated over and over. Shennan then posed the question: are these patterns real? The fact that the radiocarbon data largely mirrors the pollen data suggests that, yes, they are real. However, there is still the possibility that these patterns are spurious and are merely the result of anomalies within the calibration curve or have appeared as the results of sampling errors etc. To counter such arguments, the team devised a set of statistical tests. As Shennan said, these are quite technical and difficult to take in. If I have understood him correctly, the test centred on simulating 50,000 randomly generated radiocarbon dates, spread across the time-period under discussion and broken up into 10 year bins. These were then assigned error ranges that mimicked the real distribution of the calibration curve and the standard deviations of genuine radiocarbon dates. Essentially, they recreated 50,000 simulated radiocarbon dates with the same level of precision/imprecision (or ‘fuzziness’) as one would expect from real dates. Added to this they factored in the known levels of population growth and taphonomic decay (that there is less probability of materials surviving from earlier vs. later contexts). Together, this model predicts an exponential growth of data (and population) over time. When the simulated data is compared to the real evidence some clear patterns of higher and lower than predicted activity are revealed. This means that the results may be interpreted as being a true reflection of genuine population trends within the data and not merely artefacts of the data itself. In the Wessex-Sussex and Irish regional studies the same patterns as before are noted, with rising population booms being followed by busts. The results are less marked for other regions, such as central Germany and southern France, though this appears to be due to their smaller sample sizes available for study. Shennan and his colleagues have been able to conclude that the pattern of boom and bust are clear and genuine occurrences. A further question was asked – could there be any correlations between these results and climate patterns? The idea was that the results may still have been spurious and that the data was not indicating parallels between demography and climate, but merely reflecting the level of 14C in the atmosphere. The team used two climate proxies: the NGRIP and the Crag Cave, Co. Kerry, δ18O data. Again, a series of statistical tests were devised to eliminate all possible bias within the data. With the exception of the regional study of the Low Countries, no statistically significant correlation was found between the two sources. This again demonstrates the robustness of the data and the population expansion and contraction patterns already observed. Finally, Shennan examined a number of other studies to compare their results with his own. Similarities were noted with dates from flint mining in Britain (Kerig et al. in press) which shows a marked rise in dates around 4000 cal BC with a major fall-off and minor peaks after that time. Parallels were also found in the dates associated with causewayed enclosures (this comparison was carried out before the publication of Gathering Time). In his concluding remarks, Shennan admitted that, in many respects, it is predictable that people would take reproductive advantage of the introduction of new technology that improved their lifestyles. However, there are, as yet, no firm reasons as to what caused these cycles of boom and bust. He argues that future research must take into account the demographic history of populations both as a cause and as an effect of the process. Even with all these ideas in mind, it is still likely that the socio-economic processes that drove these cycles were different for the growth and decline phases. Essentially, the appearance of agriculture may be associated with the initial population booms observed in the various study areas, but the probable reasons for the declines are much more obscure. I hope that I have done justice to Prof. Shennan’s lecture and managed to convey at least the gist of his ideas and results. Nonetheless, I do sincerely apologise if, in the rush to write notes and keep up with the pace of delivery, I have misrepresented or misquoted the speaker. If so, please feel free to contact me, and I will endeavour to set the record straight. Update October 2013: Archaeology Magazine have just published a short piece on this research here. Science News have a slightly longer piece here. Stephen Shennan, Sean S. Downey, Adrian Timpson, Kevan Edinborough, Sue Colledge, Tim Kerig, Katie Manning, & Mark G. Thomas 'Regional population collapse followed initial agriculture booms in mid-Holocene Europe' Nature Communications 4:2486 doi: 10.1038/ ncomms3486 (2013). is available in html format and as a PDF. Points indicate archaeological site locations and colours delineate the sub-regions used to estimate demographic patterns. From Shennan et al. "We found the Irish radiocarbon catalogue invaluable for our long-term multi-region approach to prehistoric demography using summed calibrated dates as a proxy for population. Without it we have found it more or less impossible to include Ireland in our study." This link to a video by Archaeosoup Productions touches on some of the issues raised by Prof. Shennan's talk and attempts to put the discussion in a broader context - from the Palaeolithic to the break-up of Empire after WWII. Ambitious and well worth a watch!